Considering the importance of energy security and sustainable development, Sri Lanka is in the process of revising its National Energy Policy, a top official said. 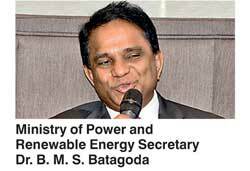 “We are in the process of revising the National Energy Policy and within a month’s period, the draft of the policy would be circulated among stakeholders for their inputs,” Power and Renewable Energy Ministry Secretary Dr B.M.S Batagoda said yesterday at a Power and Energy forum organised by the American Chamber of Commerce (AmCham). Sri Lanka’s first National Energy Policy was introduced in 2006 and was revised in 2008. Despite countries like the US, India and many others are moving away from coal power generation, Sri Lanka still continues to invest on it. “We have planned three new coal power plants. Sampur, MGM and another one which we are currently discussing with a Japanese investor,” he added. He stressed that the Government’s future directions are towards cleaner energy sources such as liquefied natural gas (LNG) and renewables like solar and wind. “We are considering whether to shift to LNG. We are already having discussion with a long term LNG supplier and will be soon calling for tenders,” the Secretary pointed out. In addition, Dr Batagoda revealed that in going forward, they would be also converting all the existing thermal power plants into LNG power plants.